As value investors, we believe the market does not correctly price many of its issues. But what are the causes of this inefficiency, and can we profit by knowing some of these causes? De Bondt and Thaler argue that a human method of interpreting data called "representativeness" causes prices to diverge from their fundamental values. More information on this human heuristic is available at Wikipedia, but basically "representativeness" is used to describe how humans use stereotypes to draw conclusions which are inappropriate. In this way, the authors argue that stocks that outperform (underperform) the market for extended periods tend to continue to do so, and this results in relatively large deviations between price and value. In effect, people believe some stocks to be outperformers, and therefore they jump on them on the expectation that they will continue to do well (and the opposite is true for underperformers). 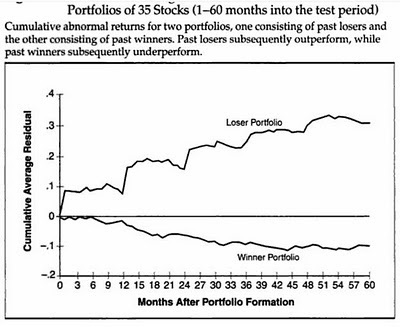 The previous losers outperformed the previous winners by about 40% in the five-year period that followed the formation of the winner/loser portfolios! The authors argue that this is evidence that winners and losers both ran too far in the previous three-year period. You may be discouraged from buying a stock you feel is at a decent price because for years its price has been under pressure. But consider that what is influencing you to feel this way could be "representativeness" and that the current dog of a stock could be tomorrow's (or the next five year's) darling! This article was written by Saj Karsan of Barel Karsan. If you enjoyed this article, please consider subscribing to the feed.